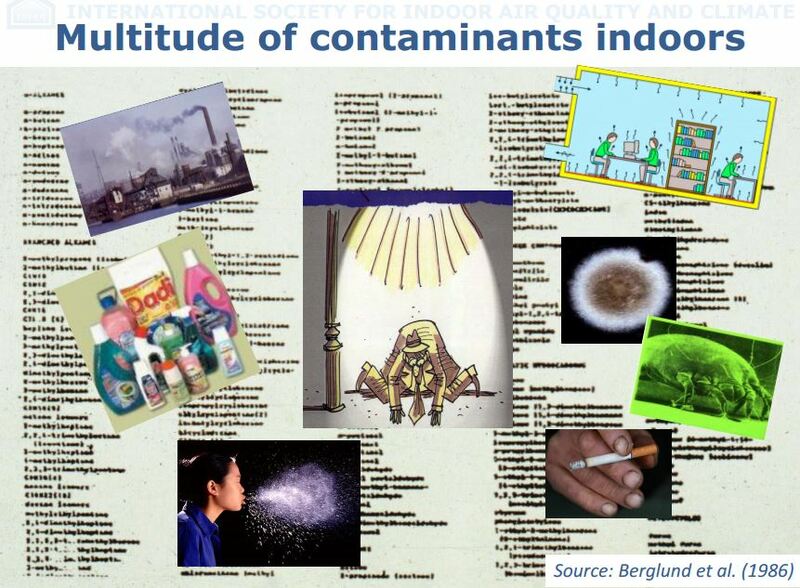 Common Indoor Contaminants--Recognize Them All? Outdoor pollutants--Factory emissions, car exhaust and particulate matter get indoors and have a hard time getting out again. Our homes are very well sealed to conserve energy, but they also keep unwanted pollution inside where we breathe it in for hours out of every day. Volatile Organic Compounds--Furniture, carpeting, equipment, personal hygiene products, air fresheners and other objects and substances you find in your workplace are or produce these irritating and sometimes even unhealthy chemicals. Formaldehyde is only one chemical that is commonly found in furniture, carpeting and adhesives. Paint and varnish also off-gas, sometimes for years. Feeling sick at work? It might be your building. Mold spores--Mold is everywhere and just needs moisture, warmth and food to grow. If you are sensitive to mold, even damp weather makes it hard for you to breathe. Dust mites--There are tiny bugs living off our dead skin cells anywhere that has stuffing or upholstery. That's your bed, pillows, couch, office chair, pretty much everywhere. And their feces can be very irritating or even cause asthma attacks. Tobacco smoke--Even if you are not a smoker yourself, second-hand smoke can damage your indoor environment. Smoke outdoors and ask your guests to do the same. Germs and bacteria--Did you know that you are most contagious BEFORE you exhibit symptoms of a cold or flu? And the best way to keep your germs to yourself is NOT covering your cough with your hand or sneezing into a tissue. Use your elbow--they are teaching this in kindergarten now, but most of us are not used to it yet. Watch this video from Mythbusters to see the proof! Cleaning products--Whether you prefer lemon or pine, Fresh Spring or Mountain Fresh, all of those scents are polluting your indoor air. Try greener options and unscented cleaners to keep your indoor air clean. The ISIAQC has missed some things that we would include on this list--candles, pollutants from cooking and hand sanitizer. And some of these substances are better dealt with by our sister company, AirTek Indoor Air Solutions. Alliance Environmental Group provides Mold Removal services and heat treatment for Dust Mites. But all of these put things in the air other than AIR. Watch out for how many you are in control of and could be avoiding!